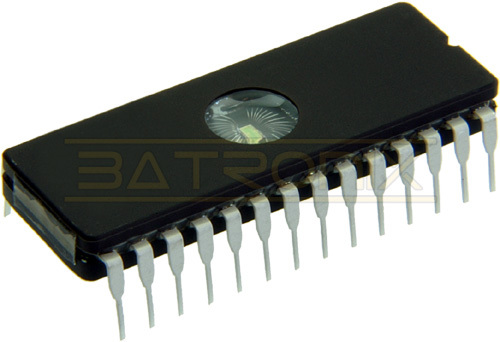 The M27C256B is a 256 Kbit EPROM offered in the two ranges UV (ultra violet erase) and OTP (one time programmable). It is ideally suited for mi- croprocessor systems and is organized as 32,768 by 8 bits. The FDIP28W (window ceramic frit-seal package) has a transparent lid which allows the user to ex-pose the chip to ultraviolet light to erase the bit pat-tern. A new pattern can then be written to the device by following the programming procedure. For applications where the content is programmed only one time and erasure is not required, the M27C256B is offered in PDIP28, PLCC32 and TSOP28 (8 x 13.4 mm) packages. and the LCCC32W (leadless chip carrier package) have a transparent lids which allow the user to ex-pose the chip to ultraviolet light to erase the bit pat-tern. A new pattern can then be written to the device by following the programming procedure. For applications where the content is programmed only one time and erasure is not required, the M27C1001 is offered in PDIP32, PLCC32 and TSOP32 (8 x 20 mm) packages.